We saw a cute Lightsaber toy at Toys"R"Us a while back during a routine Lego Duplo shopping and the idea of a DIY light saber hit us. We decided on the swimming noodles, but wasn't able to make a trip to Decathlon for a long time. Finally, during a recent visit to Daiso, we found a 60" long pool noodle at an amazing S$ 2.00. 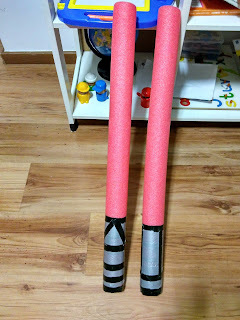 We bought it and set on to make two toddler-friendly light sabers with all raw materials available already at home. We got for two dollars from, well, the two-dollar store. Makes two swords. Patience and good mood- a lot - to diplomatically ward off a 2.5 year old kid (who constantly wants to use scissors all by herself ) and to decide when to let her help with the cutting.